So I’ve got a laundry list of things I want to do, things I should do and things I’m just not motivated to do. These are lists in life and in knitting (I’m talking about you, homework I assigned but am too tired to grade). LOL My girlfriend Rachel, who reads this blog (hi, Rachel!) is about to have a baby girl in a few weeks and I want to knit her a blanket because 1. I love Rachel 2. I knit her son a blanket that he still loves (pictured below) BUT I hate knitting baby blankets nowadays. The struggle is real, it’s a lot of the same stitch and I’d rather knit a sweater…for myself. But I have vowed to start working on the little lady’s blanket this weekend. I bought bulky yarn a while ago (a fun combo of greys, white and lavender), I’ve got size 13 needles and I’m going to make something soft and cuddly. I just don’t know what pattern yet. 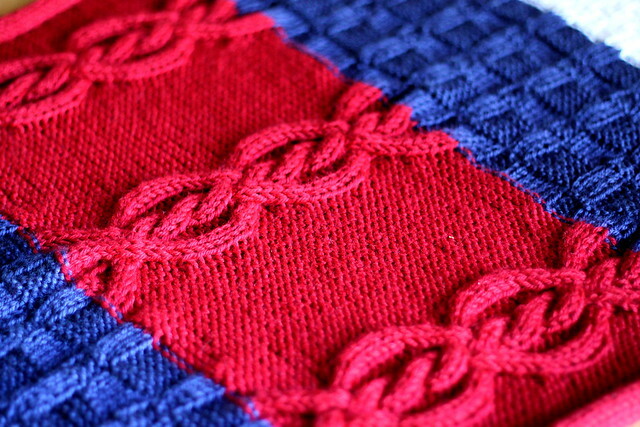 For her son’s blanket they were going with a very red, white and blue nautical vibe. So I picked out a fun cable pattern and made did a different stitch for each color on his blanket. I have loved how over the years Rachel refers to it as his “special blanket” and even though I’m only around her son once a year or so, when she tells him I’m the lady who made said special blanket he perks up. Kids are just the cutest. I have considered casting on this Falling Bobbles Blanket from Purl Soho BUT I was traumatized knitting bobbles on this very lovely bobble hat and I think I’ve made enough bobbles to last me a lifetime. We shall see what I end up creating this weekend. In the meantime, I’ve started yet another sweater. Meet my Colorblocked Lesley sweater, it’s from the Home & Away collection by Hannah Fettig. I still had several balls of the Macaw colored Mighty Stitch yarn after I finished my Green Garter Raglan, so I added a royal blue (Celestial) and white to my stash to make a fun and bright color blocked project. I’m also trying to stash bust and go through a lot of what I have in my workshop so I can have less clutter. I think the bottom ribbing will be blue and the cuffs will be ribbed with white, I want to mix it up. And so far everything I’ve knit in 2016 has had green in it – clearly this is my favorite color and what I should knit with all the time. It just makes me happy. Also I’m pretty excited that on Sunday, I’m taking a Dye Workshop at Neighborhood Fiber Co in Baltimore! 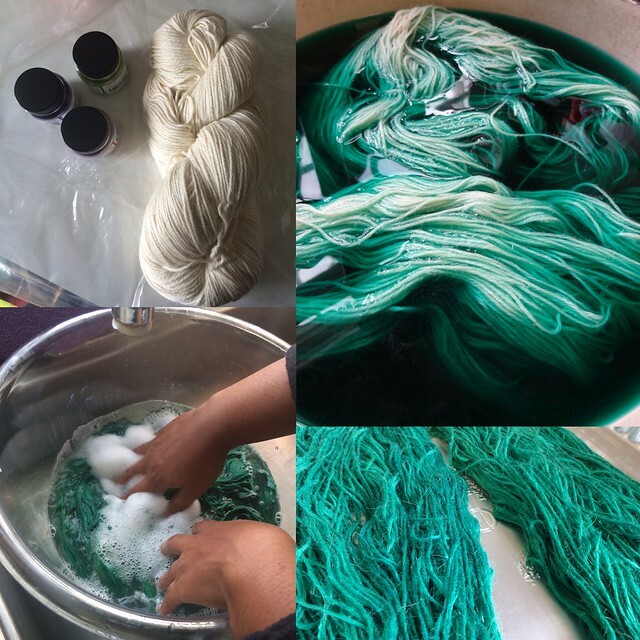 In 2014 my BFF Jess and I dyed yarn in my kitchen (pictured above) over the Thanksgiving break and I loved it but want to learn more, so when I saw a fairly local yarn business was doing workshops I decided to jump at the chance to broaden my knowledge. I love yarn, so I’m excited to see what I create in class on Sunday! Have a great weekend everyone! so what did you knit with the self dyed yarn? 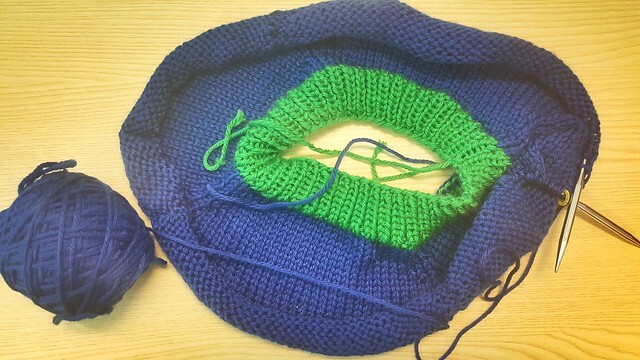 I still haven’t knit with the green. It’s DK weight but I over dyed some pink yarn purple to match a coat for my cousin. She got mittens and a hat with that yarn! I, too, find it hard to grade or do school work when there’s knitting calling my name. Hope you have a great time at the dye class; I’ve been wanting to get into natural dyeing but am trying to control the accumulation of crafty skills. Soon, though. Soon. I know, my mom says I don’t need to learn another thing. LOL but I enjoyed dyeing yarn and just want to see what else is possible. I will need you to teach me dyeing. After spinning my own yarn I have the desire to dye now. Can’t wait to see. Jess and I have dyed yarn before and it’s super easy. We can totally do it on the farm!